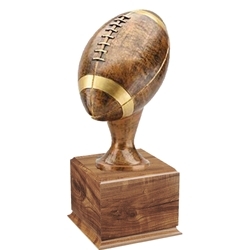 17" Tall Large Football Trophy mounted on wood base. The ultimate trophy to recognize a great performance in football or fantasy football. This unique award is perfect for Football MVP, Best Offensive Player, Best Defense Player, or Fantasy Football Perpetual Award. Football is made of resin and is regulation size. A gold name plate is placed on front of large wood base which measures 5.5" x 5.5" x 4.25" and includes your text and logo (if applicable). Order additional small name plates to use this trophy as a perpetual trophy for the remaining 3 sides of the wood base by ordering item #NP100 (see item below under related products). Recommended size .75" x 2" will fit from 4-6 small plates per side so the trophy can last you up to 18 years.